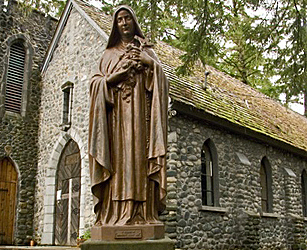 The National Shrine of St. Therese, Juneau, offers five rental cabins ranging from the small and rustic Hermitage to the beautifully appointed Little Flower Retreat Cabin. Please see the description below for more information about occupancy limits and availability. Reservation requests are accepted 6 months in advance of your stay. We invite you to experience the peace and serenity that can only be experienced by an extended stay at the Shrine. 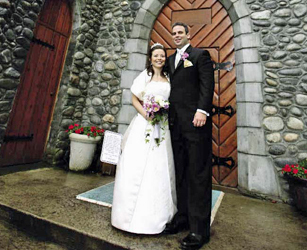 The Lodge is the oldest building on the property and originally housed the workers who built the Shrine. It was renovated in 2013 and can sleep 24 people. The Jubilee Cabin is named after the Jubilee Year called for by Saint Pope John Paul II in 2000. The cabin was built during the Jubilee Year and can sleep 14. The Little Flower Retreat Cabin is the jewel of the Shrine cabins. This luxury cabin is intended for couples and small families needing to reconnect. The Little Flower sleeps 4 adults. The Post Office Cabin sites on the site of the working U.S. Post Office of "St. Terese" from 1938-1946, the current Post Office Cabin was rebuilt in 2011. The cabin can sleep a small family or 4 adults. The Hermitage cabin was built in the 1940's and was originally used by a hermit-like priest. It is a rustic 1 room cabin with no running water or electricity. 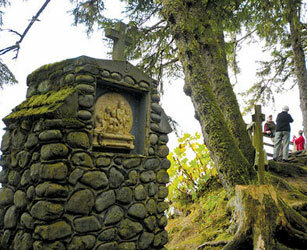 It is located just across Shrine Creek with a view that opens to the Inside Passage.